Luebke emphasizes that serving mature patrons goes way beyond simply offering a senior discount. 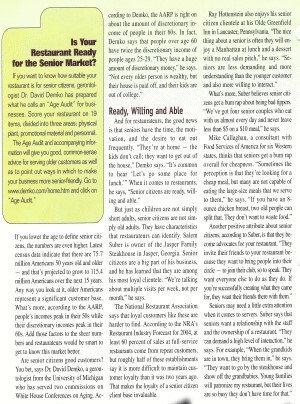 "Seniors have the time, the motivation, and the desire to eat out frequently." However, cautions Luebke, restaurant owners must understand and cater to the special needs and concerns of these affluent patrons. Don't miss this opportunity learn how to market, serve, and keep 60-plus patrons coming back again and again. The hospitality industry owes Luebke a debt of gratitude for blazing a new trail of prosperity for the hospitality industry. - Dr. David J. Demko, Edtior-in-Chief, AgeVenture Syndicated News Service. 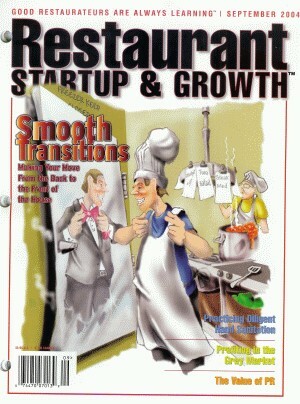 Graphic credit: Restaurant Startup & Growth magazine, Parkville, Missouri 64152.